My gators came in today! Sadly, none of my wife’s action did, but she got a bunch of games she’s pumped to use for work. Since I run a table for the 5th ed Adventurers League, (Wow, that sure feels like it needs an apostrophe) I didn’t get to jump into them right away, but they’re put together now! Stacey played for the first time in the League–she’s a relatively old hand at gaming itself, compared to most of my players–and her warlock brought much destruction to the table. She completed the ideal gaming trifecta: rolled a 20 on her first throw, had an rp idea that saved the party great misfortune, and proved the DM to be in error. I could not be more proud! I did crack the boxes open as soon as we got home, and will now get to sample Privateer Press’s customer service–hope it stacks up to my GW experience. The issue is that my Ironback Spitter has one more left arm than the standard, and an utter dearth of right ones. 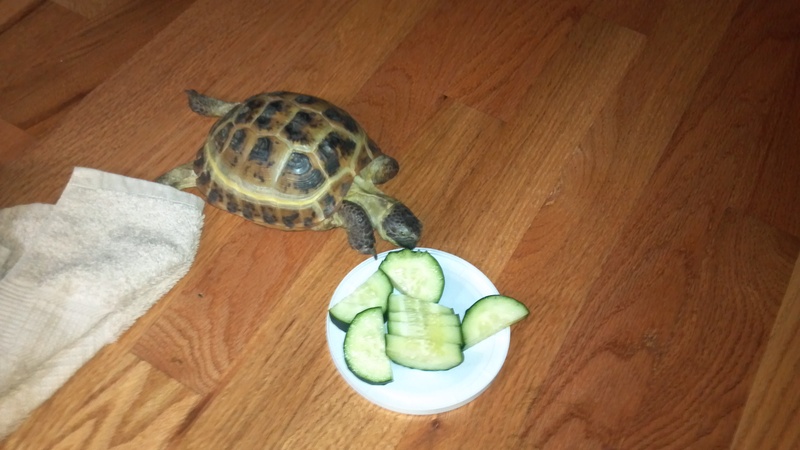 If it was legs, this wouldn’t be an issue–in loving memory of Stump, our late turtle, I was already planning to nick one of the Spitter’s rear legs. 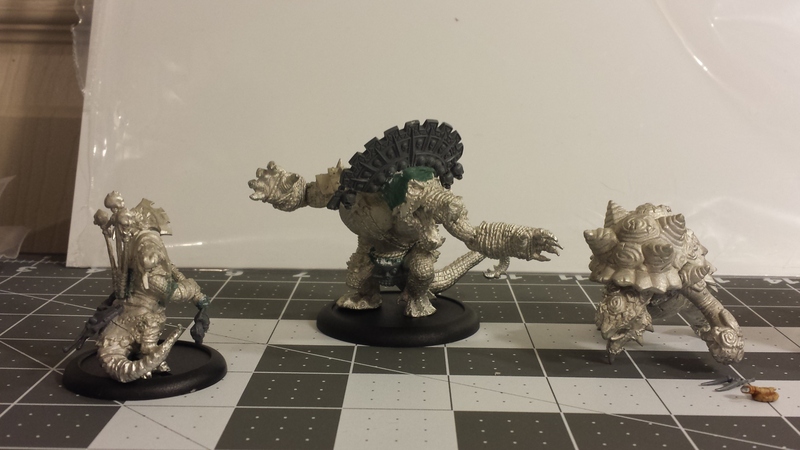 Arms, though, arms I need–WaH is big on WYSIWYG, particularly where Warbeasts and their weapons are concerned. 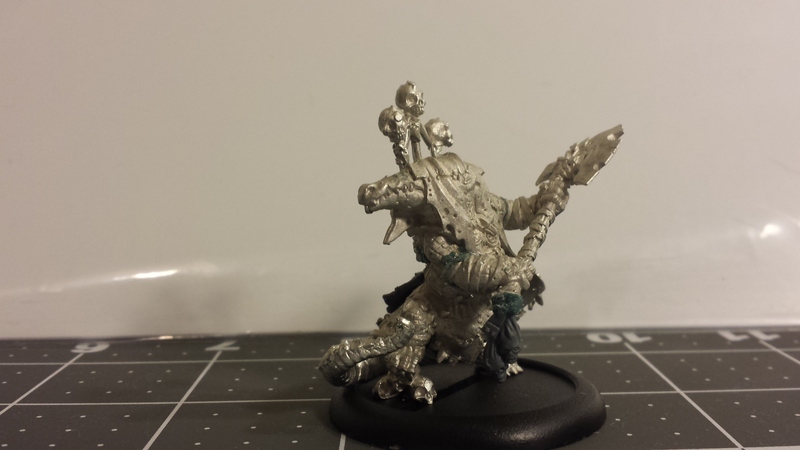 I still put the Spitter together, though I’m thinking I’ll hold off on priming her until the arm comes in. 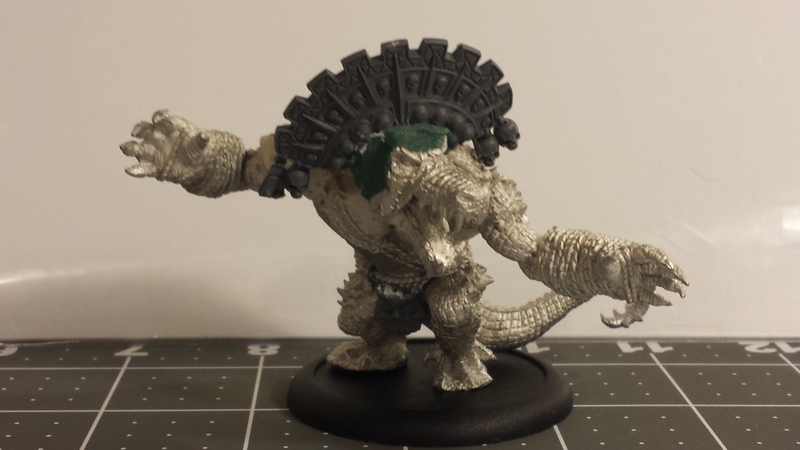 I played around a bit with the other two gators in the army, adding a festive headdress (which I hope I don’t need for anything on my lizardmen, which is where the piece is from) and a jaunty skull codpiece to the Wrastler. Codpiece! Stacey and I were both very impressed with the size and heft of the mode–Spitter too–but it’s certainly intimidating to have something that heavy. I’m not sure what else I’ll add to or tweak on the Wrastler, though I may do the ropes wrapped around his waist and fists as chains, and possibly sprinkle some skulls here and there. I mostly hope that I can do him justice on the paint scheme. As for Barnabas, I love the model and am excited to put him on the table. I made a few little alterations here, throwing on a couple bitz from kroot and lizardman kits I have lying around. I also had a hell of a time getting his axe (which has both hands molded to it) to sit on the arms, which meant I got to try pinning for the first time not involving a lavalier. I only threw a pin in one side, but hope that’ll add enough stability, alongside some greenstuff, to keep the lil’ fella together. Can’t see his meat-and-bone bag from the front, but a side-on shot doesn’t play great with an unpainted model, and at the point I give a front and back shot he’s consuming an inordinate amount of the post. I used a lot of greenstuff on these models, primarily because of my inexperience with metal. I took the time to clean excess putty off the joints, at least, which is one more sign of how much my hobby…awareness…has increased since I started out. When I look back at some of my early work, like my Noise Marines, I’m torn between the desire to saw the weapons off and start over, and the element of my personality that treats inanimate objects as sacrosanct and inviolable once they’ve entered my life. That tendency’s led to a lot of spirited discussion with my wife re: when clothing has to be thrown away, or just how long I can hang onto a notebook that has maybe 15 blank pages left. I continue to hope, though, that it’ll lead to victory from my lads on the battlefield. Tomorrow’s got a chunk of errands and hopefully some starter games with the lads, but there’s not likely to be enough time to actually prime anything before I throw it on the table. I did play a few more practice games, with more pictures–and adorable proxy-work involving hand-written life spirals–so that’s forthcoming as well. Posted in Hobby, Hordes.Tagged Blindwater Congregation, Conversions, Hordes, Journeyman League.